Hello everyone, hope my American friends are having a Happy Thanksgiving. 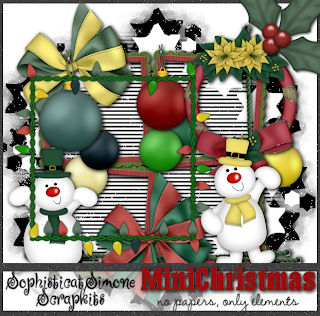 I had a bit of time yesterday and today to make a small little kit, called MiniChristmas. It has no papers, only elements and frames. You can download here. Thank you! Your blog post will be advertised on the DigiFree Digital Scrapbooking Freebie search engine today (look for timestamp: 25 Nov [LA 09:00pm] - 26 Nov [NY 12:00am, UK 05:00am, OZ 04:00pm] ). This is darling! Thanks so much. Thank you very much for sharing your beautiful designs with us!